Here are five things I learned on Wednesday night. Joe Brolly is taller than you'd think. Eamon Dunphy really hates the word 'lachrymose'. Neil Francis has a low opinion of my abilities as an NFL tipster. I'm aging a lot faster than some of the Dorian Grays of Irish journalism. And there has been an awful lot of great writing in the sports pages of the Sunday Independent over the last 30 years. We gathered together in Dublin to celebrate the launch of On The Seventh Day, a collection of the best of that writing, first in the Hodges Figgis bookshop on Dawson Street and later in the Lemon and Duke pub nearby. We're very proud of the book so excuse me if there's an odd bit of trumpet-blowing in this week's column. 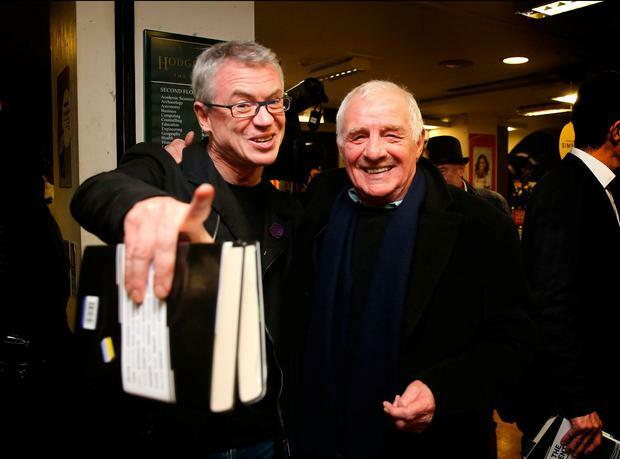 On The Seventh Day was launched by Eamon Dunphy, which was entirely fitting because I think you can divide Irish sports writing into Before Dunphy and After Dunphy. There were talented writers in the earlier era, most notably Con Houlihan who probably remains the greatest of them all. But Con's talent was so quirky and so individual it was something to be admired rather than emulated. Dunphy, on the other hand, was an inspiration. Like any great player he made those around him raise their game. There's a younger generation who probably only know Dunphy as a tabloid controversialist, entertaining but not to be taken altogether seriously. They should look at the piece he wrote in 1990 about a day spent in a London pub with George Best. Dunphy shows a different side of Best to the popular hell-raising image. This Best is a cripplingly shy, highly intelligent, gentle and haunted individual. The piece has the subtle sadness of a Chekhov short story. In this and the other Dunphy pieces collected in the book you see someone with the skills of a fine novelist employing his talent on a subject which hadn't previously been written about in this way. A famous Irish writer once said to me that Nell McCafferty was a great novelist who just happened to write journalism. I feel the same way about Eamon Dunphy. His intellectual curiosity, his empathy and above all his dedication to finding the right words made him a revolutionary figure. In the past 30 years Irish sports writing has reaped the benefits of that revolution. There was a time when the best and most intelligent writing in papers here was to be found in the arts sections. As someone who's as interested in culture as I am in sport, I've been saddened to see a precipitous decline in that area. Less and less space has been afforded to the arts and a lot of the writing on the subject is pretty weak stuff, a mixture of PR and platitudes. These days the real creativity is mainly to be found in the once-derided sports pages. Which is a pity in a way. I'd love to read an Eamon Dunphy of literary criticism or a Paul Kimmage of film reviewing but no such figures exist. You might think my praise of Dunphy and Kimmage is part of an old pal's act. In reality, I've only met the former a couple of times and the brief handshake I exchanged with the latter on Wednesday constitutes our only contact. I'm not sure I'd get on with either if I knew them better. Yet they are the two most influential contemporary figures in our trade which is why they are the stars of the anthology. Dunphy's influence was one of style, Kimmage's is one of attitude. The Football Leaks revelations in Der Spiegel mercilessly revealed how easily Manchester City have been able to manipulate a compliant sports media. There is an over-riding tendency in English sports journalism to, when push comes to shove, forget the question marks and just get behind Our Boys, behind Mo or Froomey or Sir Bradley. That this doesn't happen to the same extent over here owes a lot to Kimmage keeping the rest of us honest. He is rigorous not just in his beliefs, but in his willingness to follow those beliefs to their logical conclusion no matter how uncomfortable this may be. That's why a common reaction is, "I have a lot of time for Paul Kimmage but this time he's GONE TOO FAR." I suspect Paul Kimmage doesn't think there's such a place as too far. He's also distinguished by his interest in the psychological ramifications of participation in top-class sport. What does it require from people? How does it affect them deep down? How has it changed them? There is a flinty lack of sentimentality which probably stems from all those hours in the saddle ascending and descending the mountains and hills of Europe. Dunphy's intelligence and Kimmage's combativeness have served as inspirations for a generation of sportswriters. You can't always achieve the same heights but they offer an idea of what the job can be at its best. Both performed to a high level in their chosen sport, as did my own favourite writers at the moment, Joe Brolly and Neil Francis. None of these former stars use a ghost writer which is very important because as anyone who has ever written anything of any worth knows, you discover what you really think about a subject in the process of setting it down. There's great strength in depth in Irish sports writing. The likes of Vincent Hogan, Michael Foley, Mary Hannigan, Sinéad Kissane, Ewan MacKenna, Michael Moynihan and many others do fantastic work. Yet I do think there is a special flavour to the Sunday Independent sports section. We may not always get the credit we deserve because there are some quarters in which the Sindo is regarded as a rough and disreputable beast. I like that reputation. I didn't take up this job to earn the love of snobs and the bourgeoisie. Snobbery can lead to some of our writers, who'd be praised to the hilt were they writing elsewhere, being relatively ignored. There's no more under-rated writer than Marie Crowe and she contributes one of my favourite pieces to On The Seventh Day. It's a wonderful interview with Kieren Fallon. The piece itself is well and affectingly written but Marie's achievement goes far beyond that. First she had to secure an interview with someone who is notoriously private and guarded. Then she had to persuade him to talk about his struggles and his demons. To then convert the interview into a riveting story was the coup de grace. As a female sportswriter, Marie Crowe is very much in a minority, both in general and in the pages of the anthology. Our sports editor John Greene is unique among his peers in the interest he's taken in promoting women's sport. We've had special supplements on both the ladies football and camogie All-Ireland finals. But while putting together the collection he was necessarily constrained by the historical paucity of women in the job. It's easy to decry the gender imbalance in any collection or poll or list but to an extent those creating them are hamstrung by the sexism of the past. You also have to beware of condescension. A while back I wrote a piece praising the bravery of one of the pioneering women in Irish sports journalism and saying how difficult it must have been for her. Cue a polite email telling me that it hadn't been difficult at all, everyone had been very nice and she'd just concentrated on cracking on with the job. If someone puts together a similar collection in 30 years' time I suspect there'll be far more women included and also some representatives from the immigrant communities which are beginning to make a significant mark on Irish sport. Which is all to the good - the more diverse sports writing becomes, the more new angles will be discovered. There have been big changes in the last 30 years. At the beginning of the period covered by the book, national sports journalism was very Dublin-centric. GAA stories sometimes had the air of having been written by a Victorian explorer bravely venturing into the heart of darkness. International soccer and rugby were the big beasts on the block. In part, this reflected an era when an All-Ireland hurling semi-final, the 1985 one between Cork and Galway, might only draw 7,500 spectators and when those fundraising cards asking you to predict the score of the All-Ireland final also had a space in which to forecast the attendance, because there was never a full house. Gaelic games have become the biggest box-office sport in the country since then and there's been a kind of symbiotic relationship between the GAA and the media. Our increased coverage reflects the greater interest in the GAA but it's also contributed to it. Yet personalities matter too. The appointment of John Greene as sports editor definitely led to a greater and more knowledgeable emphasis on the GAA. John is a Longford man living in Meath. I'm a Sligo man living in Cork. Technology means that writing for a national paper these days doesn't necessitate taking up residence inside a metropolitan media bubble. Gaelic games coverage has benefited hugely from that. Looking at the book, it's striking how big a deal the national soccer team once was. The longest pieces in the book deal with the Jack Charlton years and I think that's appropriate. Viewed from a distance the passions inspired by that dizzying era seem to burn even brighter. It makes the current irrelevance of Martin O'Neill's team to the national sporting conversation seem even more dispiriting. The book was very much John Greene's baby and I think he's done a terrific job on it. Not perfect, mind. I'd have had a bit more Frano, a bit more Brolly, some extra athletics and League of Ireland. There's an unforgivable lack of road bowling. We all have our biases. Anthologies, like All-Star selections and Academy Award shortlists, are there to be argued with. So are sports sections. A literary critic said that you don't just read a good book, you have an argument with it. I think that goes for all good writing. If you're sometimes enraged or outraged at something from our pages, you're not alone. I've spent plenty of time myself shouting at the paper I've just thrown on the floor. But who reads simply to have their opinions agreed with and their prejudices confirmed? You can do that for yourself. There can hardly be two men, after all, so diametrically opposed in their political views as Neil Francis and Joe Brolly. But I relish the gusto with which both put those views across. Someone at the launch berated me for mixing sport with politics too often. But I think that's another characteristic of these pages and the book selected from them. We've always been given the freedom to say whatever we want to. And if that includes politics, so be it. As proceedings drew to a close on Wednesday night, I wondered if there might not be an elegiac Last Waltz feel to the gathering. In a social media age are the days of the ruminative intelligent piece which these men and women specialised in perhaps drawing to an end? Are broadsheet journalists poised to join the cooper, the farrier and the thatcher in the dustbin of history? Perhaps. Then again, the media futurologists who predicted not long ago that papers would have to place a huge emphasis on video have now changed their tune. It turned out Facebook had skewed the data which led to this conclusion and to the jettisoning of thousands of good print journalists in America especially. The technological arrow does not always move in the predicted direction. Books still outnumber Kindles. Having once been advised by the bright boys of social media that all content must be given away free online, papers are now setting up firewalls. So who knows? Even if we are doomed, we've had a lot of fun along the way. Thanks for sticking with us. Papers are a commercial concern which means the interests of the readership are sacrosanct. So if this has been a golden age of Irish sports writing the audience for that writing must take a lot of the credit. PT Barnum once said that no-one ever went broke underestimating the intelligence of the American public. Conversely, I don't think you can overestimate the intelligence of the Irish sporting public. People decry the dumbing down of modern culture but the exact opposite has been happening in Irish sports journalism in recent decades. John Greene has played his part in that, as did his predecessor Adhamhnan O'Sullivan and so did sports editors on other papers, the likes of Tony Leen, Malachy Logan, Shane Scanlon and others. It's a far cry from the days Dunphy spoke about at last week's launch, when editors referred to sports as "the toy department" and journeyman hacks decried the intrusion of this curly-haired ex-pro with his fancy pants intellectual ideas about their job. Not once when reading the selections in On The Seventh Day do you get the impression that someone decided to make things easy for the readers. We have tried to entertain you and to challenge you and sometimes we might have annoyed you. But we have never ever condescended to you and we never will. This is not just our book, it's your book too and I really think you'll get a kick out of reading it. Here is god's plenty. Tommy Conlon on coursing, Dermot Crowe on how very different GAA clubs keep the flame alive, some lovely horse racing pieces by the great poet and memoirist Anthony Cronin, Mick Doyle on rugby, a pair of wonderful Páidí Ó Sé interviews by Kevin Kimmage and Dermot Gilleece on Jack Nicklaus's farewell to the British Open. I have a special fondness for Colm O'Rourke's guide to surviving the club dinner dance. Sport without humour is like a footballer wearing only one boot. We used to be a bit insecure about our work. There was a vogue once for a kind of faux American style, "Jim's a good guy, a tough guy, gets it done," which made journalists sound like they were narrating a film noir. And also for positing sport as a kind of tenuous metaphor for something ostensibly more important or for claiming that sport was a kind of art form. That cultural cringe has left the building. We know now that it's worth covering for its own sake, this phenomenon which engages so much attention, excites so much passion, unites communities and divides opinion. It demands to be taken seriously. So we look at it, hold it up to the light and turn it round so as to see it from every possible angle. What comes across most in the book is the great joy we've had writing about something we love so much. We are not blind to its faults but we never lose sight of its glory either. So buy the book, not because it will make us rich (it won't) but because you'll enjoy it. And buy one for someone else too. They probably have enough socks at this stage. Thanks again. We couldn't have done it without you. We love you. Vincent Hogan at Augusta The great migration to see Tiger Woods climb the hill up Augusta's 18th spoke less of a desire to witness a tournament win than an historical event. Vincent Hogan In a neatly sardonic twist, David Moyes's final game as Manchester United manager was at Goodison Park, against his former employers, Everton.